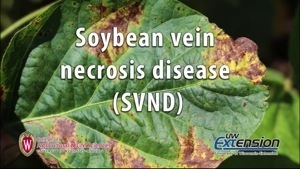 In 2012 soybean vein necrosis disease (SVND) was described for the first time in Wisconsin (http://fyi.uwex.edu/fieldcroppathology/files/2012/10/SVNaV.pdf). This is a relatively new disease of soybean, which is caused by Soybean vein necrosis virus (SVNV). SVNV was first described in 2008 in the Mid-south soybean production region. Since then, SVND has been found in much of the major soybean production region of the U.S. including the North Central region. To learn more about SVNV download a new UWEX fact sheet at http://fyi.uwex.edu/fieldcroppathology/files/2013/04/Soybean-Vein-Necrosis-Disease.pdf. A new video was recently developed on SVNV in Wisconsin. Dr. Damon Smith talks about SVND, which includes tips on spotting symptoms of SVND and information about the likely vectors of the pathogen. The video can be found at the top of this article. Khatabi, B., Wen, R.-H., Hershman, D.E., Kennedy, B.S., Newman, M.A., and Hajimorad, M.R. 2012. Generation of polyclonal antibodies and serological analyses of nucleocapsid protein of Soybean vein necrosis-associated virus: A distinct soybean infecting tospovirus serotype. Eur. J. Plant Pathol. 133:783-790. Smith, D.L. Fritz, C. Watson, Q. Willis, D.K. German, T.L. Phibbs, A., Mueller, D., Dittman, D., Saalau-Rojas, E., Whitham, S.A. 2013. First Report of Soybean Vein Necrosis Disease Caused by Soybean vein necrosis-associated virus in Wisconsin and Iowa. Plant Dis. 97:693. Zhou, J., and Tzanetakis, I. E. 2013. Epidemiology of Soybean vein necrosis-associated virus. Phytopathology 103:966-971. Zhou, J., Kanatartzi, S.K., Wen, R.-H. Newman, M., Hajimorad, M.R., Rupe, J.C., and Tzanetakis, I.E. 2011. Molecular characterization of a new tospovirus infecting soybean. Virus Genes 43:289-295. Previous post: Fall soil sampling: Another challenging prospect?